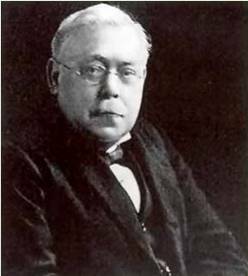 Budge was a prolific author, and he is especially remembered today for his works on Egyptian religion and his hieroglyphic primers. Budge's works were widely read by the educated public and among those seeking comparative ethnological data, including Sir James Frazer, who incorporated some of Budge's ideas on Osiris into his monumental work entitled The Golden Bough. Budge's works on Egyptian religion have remained consistently in print since they entered the public domain. The following myth is taken from ancient Egyptian Texts that were translated by and published in his book entitled: Legends of the Gods (London, 1912). Wiedemann respectively, and summaries of its contents were given by Erman and Maspero. A transcript of the hieratic text into hieroglyphics, with transliteration and translation, was published by me in 1895.
with words of power and spells with which to protect themselves against the bites of serpents and other noxious reptiles. The legend of the Destruction of Mankind affords no explanation of this remarkable fact, but when we read the following legend of Ra and Isis we understand why Ra, though king of the gods, was afraid of the reptiles which lived in the kingdom of Keb. 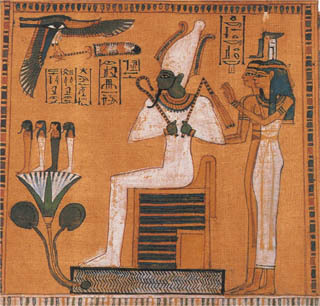 The legend, or "Chapter of the Divine God," begins by enumerating the mighty attributes of Ra as the creator of the universe, and describes the god of "many names" as unknowable, even by the gods. At this time Isis lived in the form of a woman who possessed the knowledge of spells and incantations, that is to say, she was regarded much in the same way as modern African peoples regard their "medicine-women," or "witch-women." She had used her spells on men, and was tired of exercising her powers on them, and she craved the opportunity of making herself mistress of gods and spirits as well as of men. She meditated how she could make herself mistress both of heaven and earth, and finally she decided that she could only obtain the power she wanted if she possessed the knowledge of the secret name of Ra, in which his very existence was bound up. Ra guarded this name most jealously, for he knew that if he revealed it to any being he would henceforth be at that being's mercy. Isis saw that it was impossible to make Ra declare his name to her by ordinary methods, and she therefore thought out the following plan. It was well known in Egypt and the Sudan at a very early period that if a magician obtained some portion of a person's body, e.g., a hair, a paring of a nail, a fragment of skin, or a portion of some efflux from the body, spells could be used upon them which would have the effect of causing grievous harm to that person. Isis noted that Ra had become old and feeble, and that as he went about he dribbled at the mouth, and that his saliva fell upon the ground. Watching her opportunity she caught some of the saliva of Ra and mixing it with dust, she moulded it into the form of a large serpent, with poison-fangs, and having uttered her spells over it, she left the serpent lying on the path, by which Ra travelled day by day as he went about inspecting Egypt, so that it might strike at him as he passed along. We may note in passing that the Banyoro in the Sudan employ serpents in killing buffaloes at the present day. They catch a puff-adder in a noose, and then nail it alive by the tip of its tail to the round in the middle of a buffalo track, so that when an animal passes the reptile may strike at it. Presently a buffalo comes along, does what it is expected to do, and then the puff-adder strikes at it, injects its poison, and the animal dies soon after. As many as ten buffaloes have been killed in a day by one puff-adder. The body of the first buffalo is not eaten, for it is regarded as poisoned meat, but all the others are used as food. was terrible, and Ra cried out in agony. His jaws chattered, his lips trembled, and he became speechless for a time; never before had be suffered such pain. The gods hearing his cry rushed to him, and when he could speak he told them that he had been bitten by a deadly serpent. In spite of all the words of power which were known to him, and his secret name which had been hidden in his body at his birth, a serpent had bitten him, and he was being consumed with a fiery pain. He then commanded that all the gods who had any knowledge of magical spells should come to him, and when they came, Isis, the great lady of spells, the destroyer of diseases, and the revivifier of the dead, came with them. Turning to Ra she said, "What hath happened, O divine Father?" and in answer the god told her that a serpent had bitten him, that he was hotter than fire and colder than water, that his limbs quaked, and that he was losing the power of sight. Then Isis said to him with guile, "Divine Father, tell me thy name, for he who uttereth his own name shall live." Thereupon Ra proceeded to enumerate the various things that he had done, and to describe his creative acts, and ended his speech to Isis by saying, that he was Khepera in the morning, Ra at noon, and Temu in the evening. Apparently he thought that the naming of these three great names would satisfy Isis, and that she would immediately pronounce a word of power and stop the pain in his body, which, during his speech, had become more acute. Isis, however, was not deceived, and she knew well that Ra had not declared to her his hidden name; this she told him, and she begged him once again to tell her his name. For a time the god refused to utter the name, but as the pain in his body became more violent, and the poison passed through his veins like fire, he said, "Isis shall search in me, and my name shall pass from my body into hers." At that moment Ra removed himself from the sight of the gods in his Boat, and the Throne in the Boat of Millions of Years had no occupant. The great name of Ra was, it seems, hidden in his heart, and Isis, having some doubt as to whether Ra would keep his word or not, agreed with Horus that Ra must be made to take an oath to part with his two Eyes, that is, the Sun and the Moon. At length Ra allowed his heart to be taken from his body, and his great and secret name, whereby he lived, passed into the possession of Isis. Ra thus became to all intents and purposes a dead god. Then Isis, strong in the power of her spells, said: "Flow, poison, come out of Ra. Eye of Horus, come out of Ra, and shine outside his mouth. It is I, Isis, who work, and I have made the poison to fall on the ground. Verily the name of the great god is taken from him, Ra shall live and the poison shall die; if the poison live Ra shall die." irresistible. If the words were written on papyrus or linen over a figure of Temu or Heru-hekenu, or Isis, or Horus, they became a mighty charm. If the papyrus or linen were steeped in water and the water drunk, the words were equally efficacious as a charm against snake-bites. To this day water in which the written words of a text from the Kur'an have been dissolved, or water drunk from a bowl on the inside of which religious texts have been written, is still regarded as a never failing charm in Egypt and the Sudan. Thus we see that the modern custom of drinking magical water was derived from the ancient Egyptians, who believed that it conveyed into their bodies the actual power of their gods.